You know those tiny reset buttons on the back of electronics? They require something tiny to push the little button– like a pin or unwound paperclip. Follow these steps to transform a mere paperclip into a tool. Continue reading Paperclip? Or Tool? Posted on October 15, 2018 October 17, 2018 Categories humor, lifeTags electronics, paperclipsLeave a comment on Paperclip? Or Tool? Or just Germans being German? Is this a thing? I supposed there are still folks out there who use the “porch” pronunciation… or are there? Posted on December 10, 2016 Categories cars, humorTags Duetsch, Language, Porsche, SchadenfreudeLeave a comment on Porsche Humor? Left Hand, meet Right Hand. My recent switch to AT&T Uverse had me feeling like a character from Terry Gilliam’s cult classic movie Brazil. Every step of the way we discovered a different department that operated some obscure nuance of the AT&T bureaucracy- yet operated as a wholly independent entity. The Uverse people can’t help you with wireless services, a traditioinal landline is another department, legacy DSL is handled completely separately and on and on. This is one of the better hoaxes I’ve seen so far this April Fool’s Day. Virgin Atlantic announced the unveiling of a new glass-bottom airliner. You might reconsider after viewing this compilation of videos from Russia. It’s not stunt driving- it’s normal everyday traffic. First there was Black Friday. Then there was Cyber Monday. This year we discovered Grey Thursday. Now it’s time to prepare for the end of the Mayan calendar. By shopping at Sam’s Club! 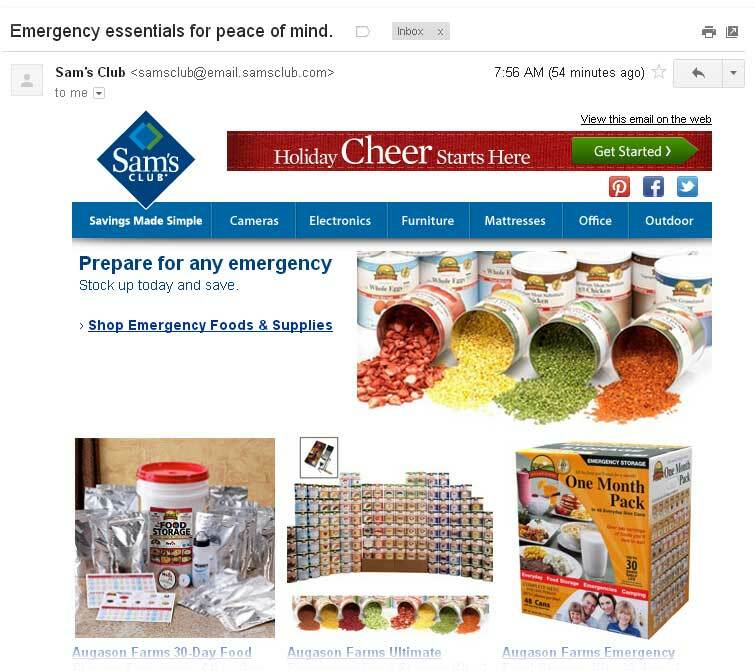 A recent email promo touts the wonderful selection of emergency supplies available from the Bentonville-based warehouse club. This is the first concrete proof I have seen that supports this theory that the world will end on December 21, 2012. Of course that headline caught my eye. The airline in question is the North Korean state-run carrier, Air Koryo. Browsing through the site is like taking the Wayback Machine to the cold war-era. For instance, the “news” section offers insight on the company’s newest equipment- the Tupolev 204. This “new” jet dates back to Aeroflot’s fleet from 1989 and “has 12 business classes and 164 economy classes.” Classes? I think that means seats.